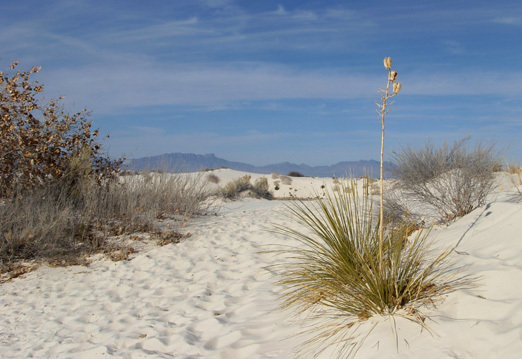 "At the northern end of the Chihuahuan Desert lies a mountain-ringed valley, the Tularosa Basin. 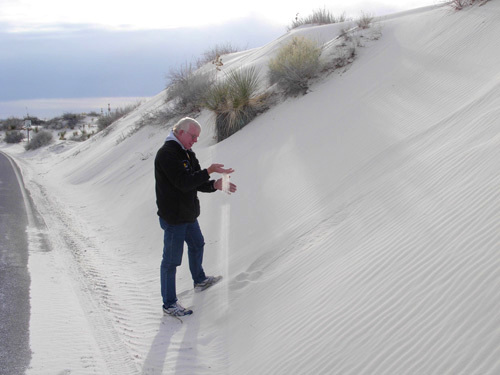 engulfed 275 square miles of desert and have created the world's largest gypsum dune field." Wanna feel like a kid again?? 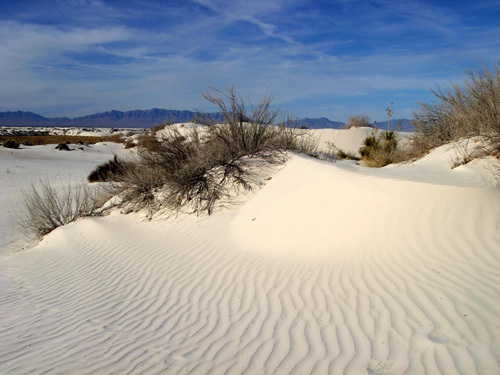 Go to White Sands National Monument and play in the most perfect sand you'll find anywhere! 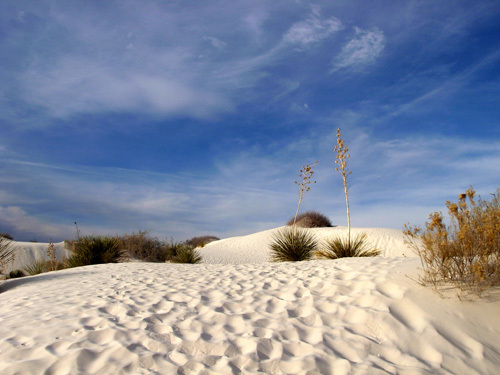 I can't imagine there are any other sand dunes as magnificent as these, and you won't find such glistening, powdery gypsum on a beach anywhere in the world. We had a fine morning for our visit today -- cool (30s to 50s) and mostly sunny with an interesting mix of clouds and bright blue sky that is a beautiful contrast to the white sand. All these photos were taken this morning, although the sky looks like they were taken on different days! It was wonderful to have the place mostly to ourselves, too. 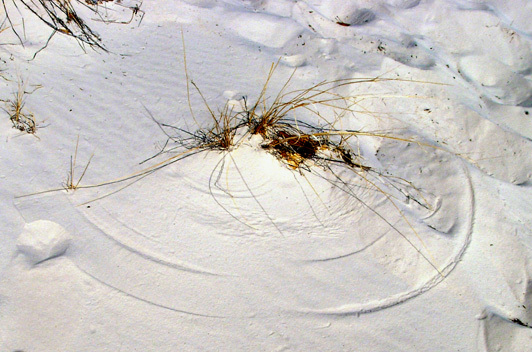 I've decided that January is the perfect time to visit the perfect dunes. Well, maybe February or March would be nicer with the flowers in bloom, but the downside would be having to share them with a lot of other visitors . . . This national monument (I'll mostly refer to it as a "park") is a 35-mile drive from the post on the missile range where we are camped. It's closer to room or camp in Alamogordo but the out-and-back drive worked better for us on this particular trip. Be aware that Hwy. 70 and the park are surrounded by the missile range. Both the road and park are shut down for one or two hours an average of twice a week during missile testing. Fortunately, that didn't affect us going to or from the park today. Getting close! First view of dune edge from Hwy. 70. The edges have more vegetation than the middle. Also, there is an inspection station going northbound to the park. You'll find these stations all over southern Texas, New Mexico, and Arizona because of the proximity to Mexico. In California, inspectors are looking for out-of-state fruits and vegetables. Here, the Border Patrol is looking for illegals from Mexico. None of our Border Patrol inspection stops took very long on this Southwest trip. One station just eye-balled us, asked no questions, and waved us through! Usually they asked just one or two questions about our destination. No one wanted to look inside our camper. We passed the Old Fogie Retiree test, I suppose (even if it didn't work at the missile range). 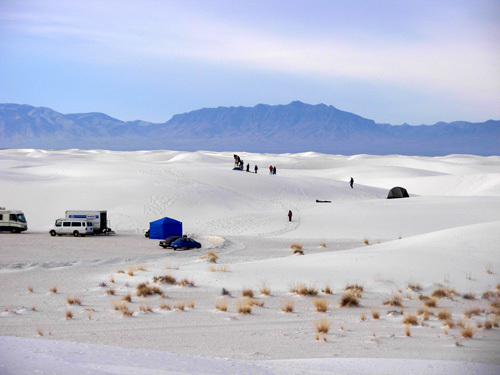 White Sands is open every day except Christmas and has extended night-time hours from May to September when the moon is full. It would be awesome to see these dunes in full moonlight! The good news is that the moon is full right now. The bad news is that we will be moving on this afternoon to Carlsbad. Rats. We should have planned that better! A sunset walk on any evening with some clouds would be very nice, too. 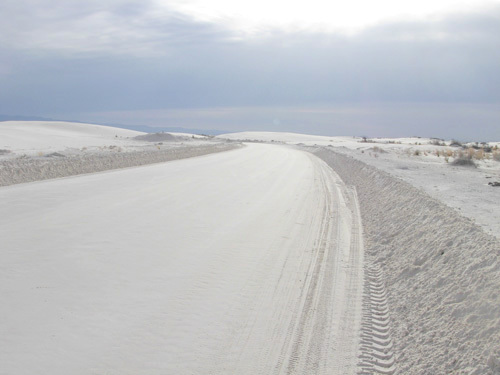 If you have one of the various national parks passes, admission to White Sands is free. Without one of those the cost is just $3 per adult. Kids under 17 get in free. 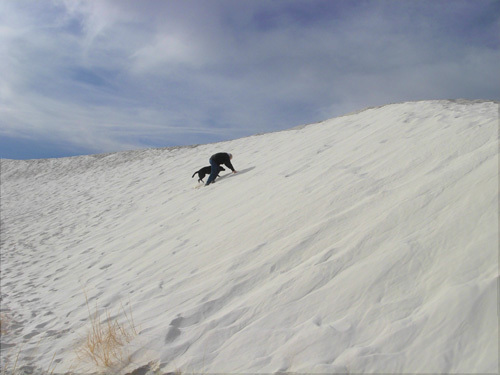 Kids would have an absolute blast running up and down the dune area where such activity is allowed. I mean, as much fun as we Old Pharts had . . . 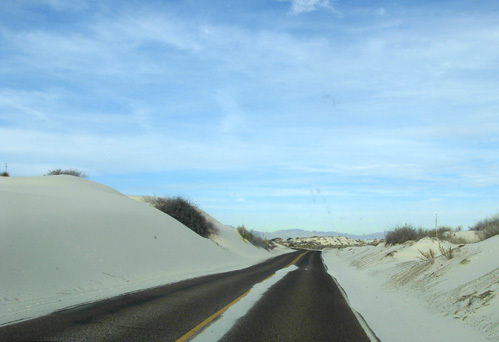 The road through the park is part paved, part hard-packed sand. There is probably pavement under it somewhere! Although we didn't take our camper to the park, most of the pull-offs to the various trails and observation points will accommodate RVs. If you've never been to the park before, your first stop should be the visitors' center. It is housed in an old pueblo building near the entrance (before the pay station). 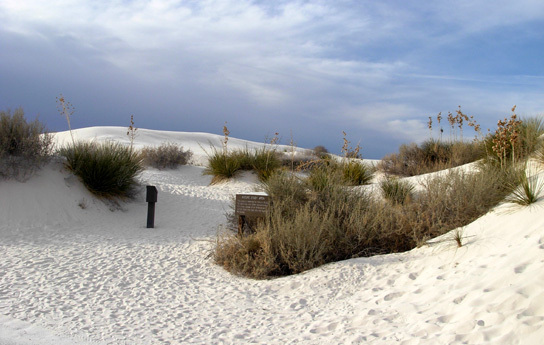 Exhibits and videos explain the origin of the park, how the four types of dunes are formed, how they continually shift, and how plants and animals deal with the harsh environment. It's pretty doggone interesting, if you ask us! 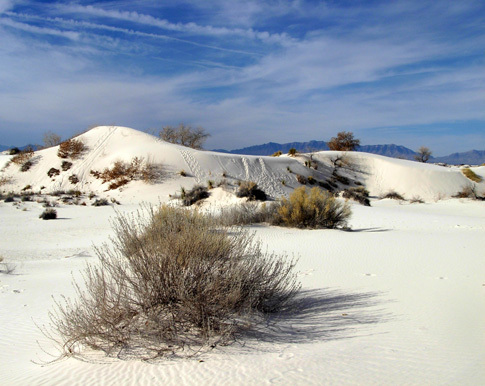 The gypsum that forms the beautiful white sand you see in these photos was deposited at the bottom of a shallow sea that covered this area 250 million years ago, according to the park brochure. They turned into stone over the millenia, then were uplifted into a giant dome 70 million years ago (at the time the Rockies were also formed). 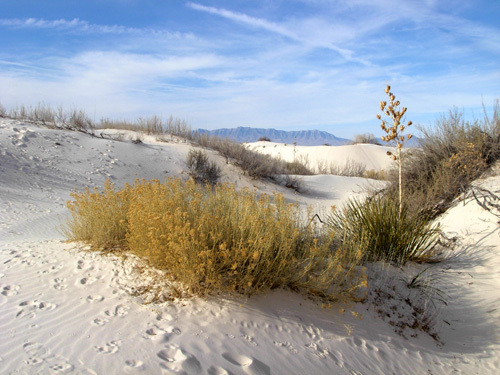 Ten million years ago the center of the dome began to collapse and create the Tularosa Basin. The sides of the dome that remained formed the San Andres and Sacramento mountains that currently surround the basin. Rain and snow that fall in these mountains dissolve gypsum and carry it to the basin, where it stays. This basin is unusual in that no creeks or rivers drain from it. 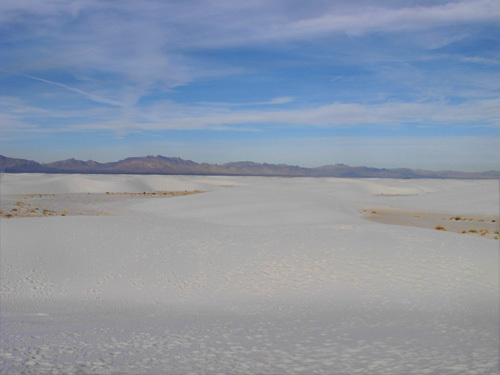 There is very little water in the basin to dissolve the gypsum. Long story short, it stays in the basin at Lake Lucero. 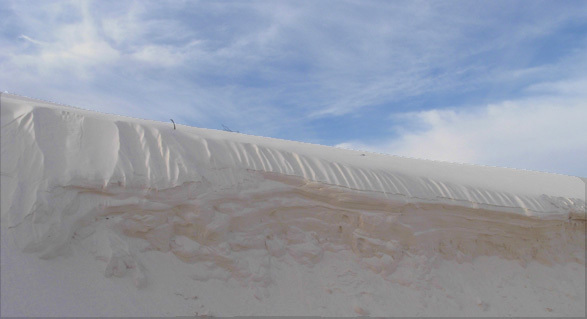 Eventually the crystals are turned into fine sand by the heat and cold, wet and dry conditions. 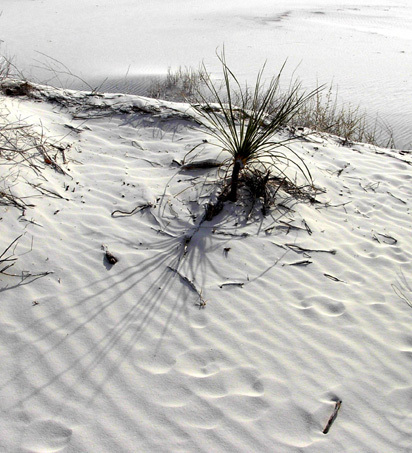 They are so light, the wind carries them to the ever-shifting dunes northeast of the lake. We love to let it run through our fingers like that! It is cool to the touch and oh, so very soft and powdery. Visitors mostly drive themselves along Dunes Drive, choosing when and where to stop. 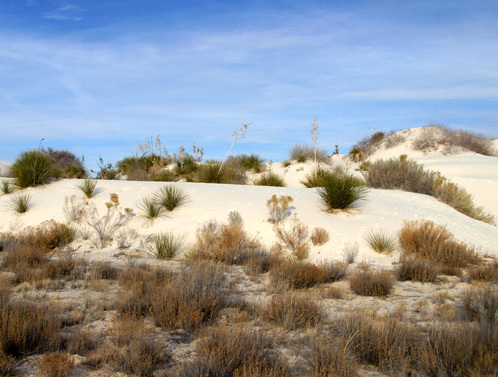 Wayside exhibits interpret the geology and natural history of the dunes, flora, and fauna. There are four main trails along the road, and others that extend into the backcountry. Auto caravan tours to Lake Lucero and motor coach tours are by reservation only. Rangers also conduct nature walks and other programs that are free. Today Jim and I had just a few hours to spend in the park before we had to check out of the campground and leave for Carlsbad. But we accomplished a lot in that time. That sure looks like snow, doesn't it?? 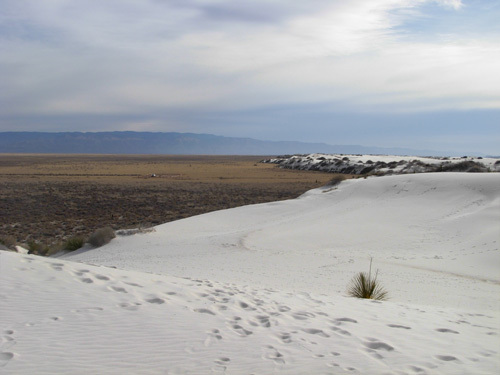 Although the high desert gets hot in the summer, the snow-like dunes probably make visitors feel a bit cooler then. We stopped to take some photos but didn't let the dogs out until we reached the loop at the end of the drive (the "Heart of the Dunes" area). 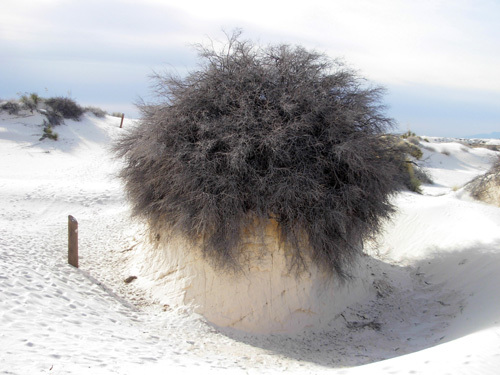 Here visitors are encouraged to climb up and slide down the dunes because there are very few plants to disturb. On the other trails there are signs to stay on or near the established paths and leave all the plants intact. They are as fragile in this environment as alpine plants in the tundra. 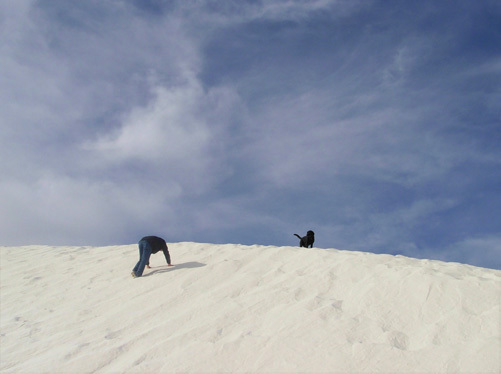 Cody and Jim climb up a 25-30 foot sand dune. Guess who gets to the top first?? 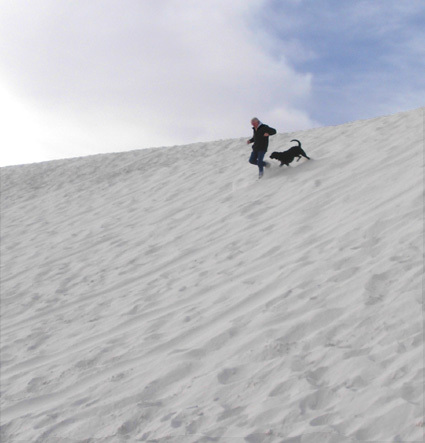 Cody liked playing in the sand as much as he enjoys snowdrifts! I think he was a little startled when he first set foot on the sand, realizing something was different -- especially the taste! But he stuck his nose in it and rolled around in it just like he does in the snow. It was very funny to watch him! Tater was more restrained, as usual, but had fun sniffing and running around in the snow, I mean sand. Cody keeps going back and forth, teasing Jim, who discovers using four feet really IS easier! 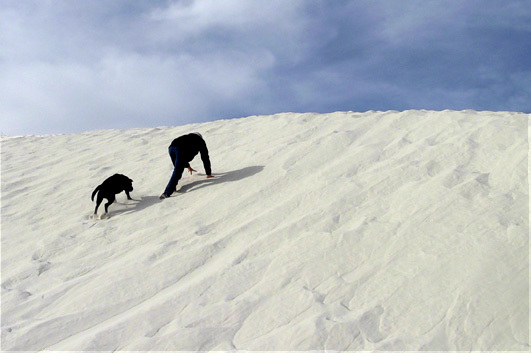 Jim decided to climb one of the dunes and of course Cody had to follow him. He's always up for whatever adventures we can find. 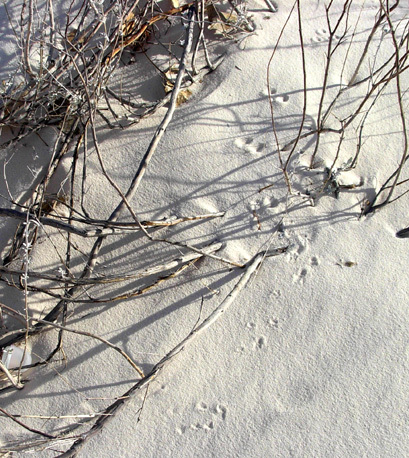 As you can see in the photos above and below, the dune was relatively steep and the footing was soft and loose. Jim ended up on "all fours" to get to the top. And guess who got there first despite running back and forth all the way up? Cody is King of the Hill. I didn't think Tater could make it up the dune that way so she and I climbed up from the back side and took in the magnificent view of the basin from the top of the dune. A couple of the photos farther above in this entry show the views to the San Andres Mountains. We both had to empty a bunch of sand out of our shoes after that little excursion! The four of us managed to track a lot of the powdery stuff into the truck. 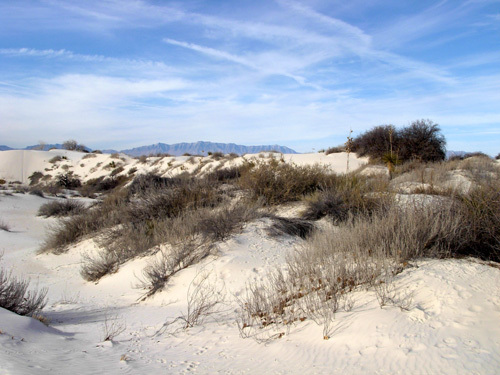 As we drove back out toward the entrance to the park we stopped at the trail that interested us the most for a walk: the Dune Life Nature Trail. We picked up one of the brochures at the trail head and had fun reading about the plant life, dune formations, and animal tracks that we saw along the trail (explanations match numbered posts). The remainder of the photos are around this one-mile loop. Passages in quotations are from the trail guide. 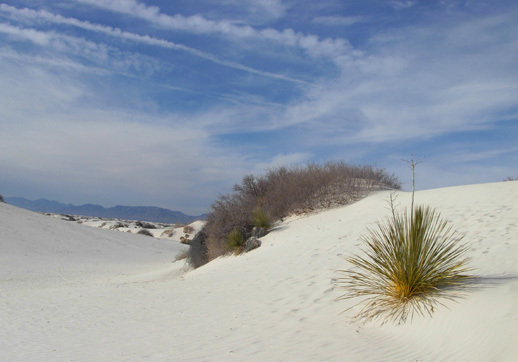 "Many people think of the desert as a barren wasteland and are surprised to discover that a large variety of wildlife exists here. Nature has developed special adaptations to enable the plants and animals to survive this hostile environment." 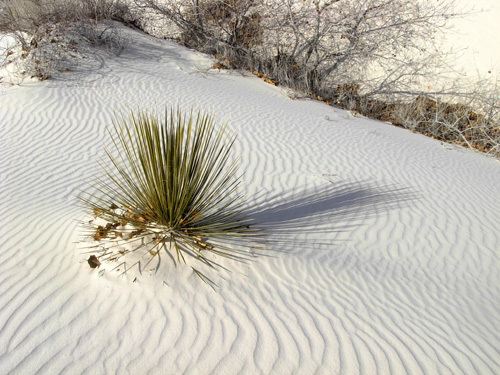 The Soaptree Yucca, New Mexico's state flower, is one of only about eight plants that can survive the shifting gypsum dunes As a dune starts to bury a yucca, its stem grows rapidly to keep its leaves above the sand. Some have grown as tall as forty feet. 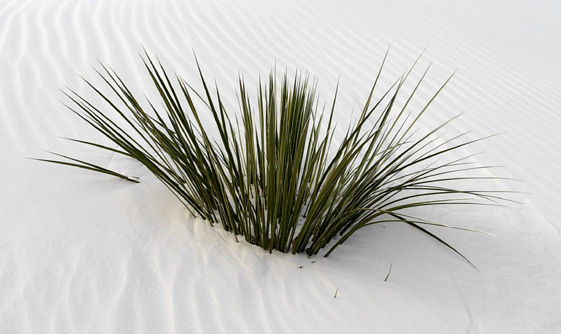 Some plants in the dunes have adapted by growing roots up to thirty feet long in order to reach water and anchor themselves firmly in the sand. 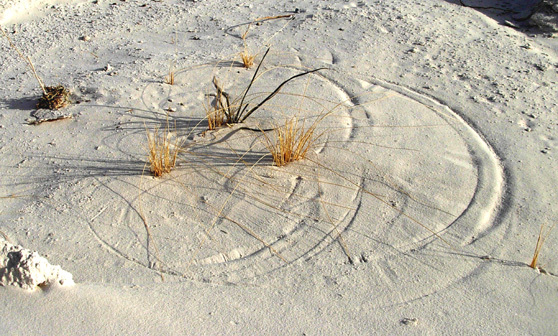 Desert grasses and shrubs like the Fourwing Saltbush have also developed a tolerance for the highly alkaline sand. That was the only critter we saw along this trail. It's unusual to see a rabbit here during the day, especially one that sits there for several minutes while you're talking to it and taking pictures! See how nicely he blends in with the grass? 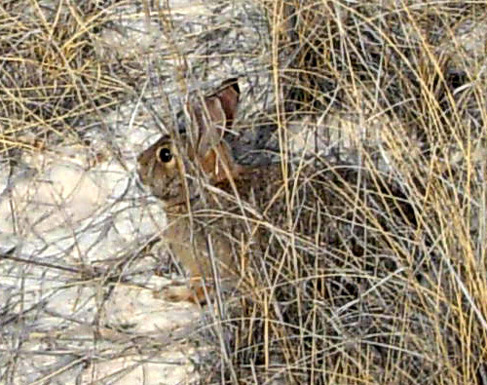 Makes it harder for predators to spot him. Cottonwood trees like water, so how the heck can they grow here?? They have roots that extend down to a reservoir of water that is trapped on top of a layer of clay deposited by an ancient lake during the last ice age. The clay layer, which is about 25 feet down, prevents the water from sinking any deeper into the ground. This is called a "perched water table" and it can even flood the inter-dune areas after heavy rains. A flood in the desert. Imagine that! This place is truly a photographer's dream, whether you're an amateur like me, or a professional. 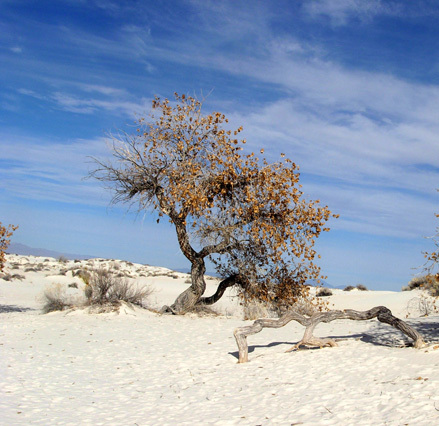 If you've been to White Sands previously, I hope these photos bring back good memories. If you've never been there, I hope they tempt you to go! 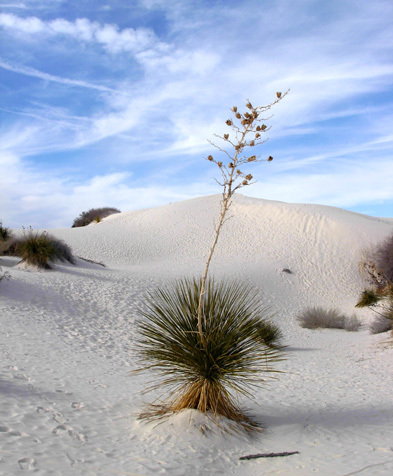 Here is the link to the official web site for the White Sands National Monument. We got back to the campground at the missile range about noon, ate some lunch, and said good-bye to this part of New Mexico. Next stop, a private campground in Carlsbad, NM where we'd made reservations for the night. 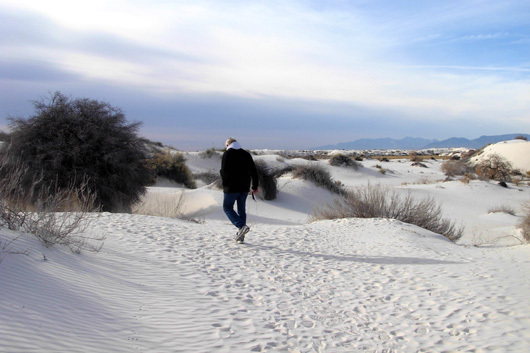 When we planned out this part of the trip we saw there were two logical ways to get from White Sands to Carlsbad Caverns, our real destination, but only one made sense in January since we'd already seen snow at the 8,000-foot level or lower. That's why we stayed at the missile range and not closer to Alamogordo. In the summer we would have tried Hwy. 82 east of Alamogordo through the Sacramento Mountains and south on 285 to Carlsbad. That's a shorter route than we took and would probably be more scenic. But it also has a, 8,650-foot pass near Cloudcroft and we didn't know if snow or ice would be a problem there. So we retraced our steps back to Las Cruces, NM, headed down 1-25 to El Paso, TX, took a horrible route through the city to reach Hwy. 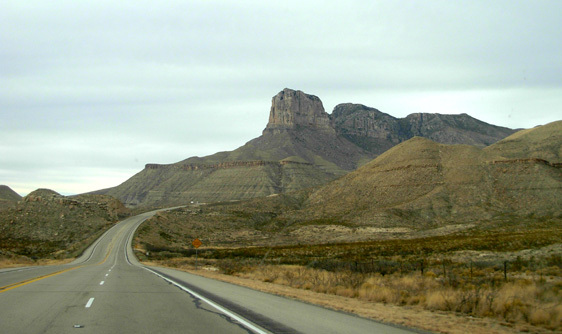 62, then enjoyed the rest of the trip through isolated territory in Texas that became more interesting (and mountainous) as we approached the Guadalupe Mountains and national park. In retrospect, we wish we'd spent the night camping in the national park instead of the town of Carlsbad (there is no camping at the caverns); it would have been cheaper and more pleasant. That's the second time we've driven by Guadalupe NP on the way to Carlsbad Caverns without going into the park. Next time we need to check it out! The entrance road to Carlsbad Caverns is thirty-five miles from the entrance to Guadalupe National Park. We crossed back into New Mexico in the middle of that stretch. The town of Carlsbad is another sixteen miles north. To reach the Windmill RV Park (a Good Sam campground a bit south of town) we had to drive past the caverns another twelve miles -- and then go back the next morning to tour the caverns. The campground was very crowded with what appeared to be mostly long-term campers (bad news). The sites are very narrow (bad news) but all are pull-thrus (good news) so we didn't have to back in. It was already down to 32 degrees when we pulled in near supper-time, too cold to hook up the hose for running water (bad news). The spigot was frozen in the morning, preventing adding more water to the tank then, either (more bad news). Fortunately we had plenty of water in our tank for two days (good news!). The only thing we liked about this experience was using the nice rec building with laundry and WiFi. We're never as happy in private campgrounds as we are in parks, military bases, or national forest / BLM boon-docking sites. We'd rather have space and quiet than expensive amenities we can't or don't use. But since we'd made reservations, we chose to stay the first night. We were tired and it made no sense to drive back down to Guadalupe NP. We cancelled Wednesday's reservation with no penalty. Our main reason for canceling was the predicted ice and/or snow storm that was rapidly approaching the area. Uh, oh, shades of what happened to us here in February, 2004! More about that in the next entry. Next up: if it's Wednesday, this must be Carlsbad Caverns.